Unfortunately I am unable to post my trades at the close of trading because it takes 1 day to settle. 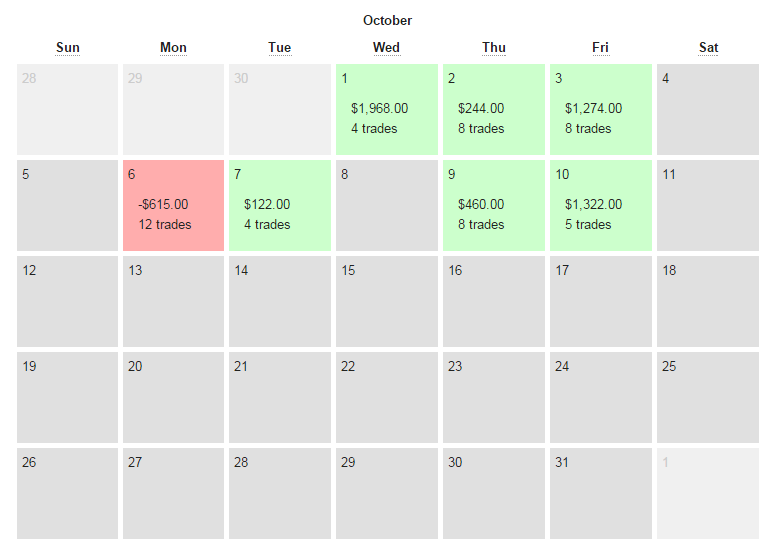 What I will most likely do is recap my trades at the end of week just as I am doing now. I’m a huge fan of all the statistics I am able to gather with Tradervue and I highly recommend it to anyone who is really serious about this. So, how did I do my first 3 days back on the cash account? I did well! I took my trades as I said I would but I do have a large problem that will cost me money in the long term. I need to pick my entry price in advance AND grab it on a downtick if going long (vice versa if short). I kept paying up on a tick in my favor and thats when they really drive up the price of options. On most of my trades I really could have entered for at least 20-50c cheaper… which is a HUGE deal for me. That will be my main focus next week… is paying the price that I choose. With a better entry price, my losers should also reduce in size. What is great is my ability to pull the trigger now. Those 70 trades on the simulator really did help. 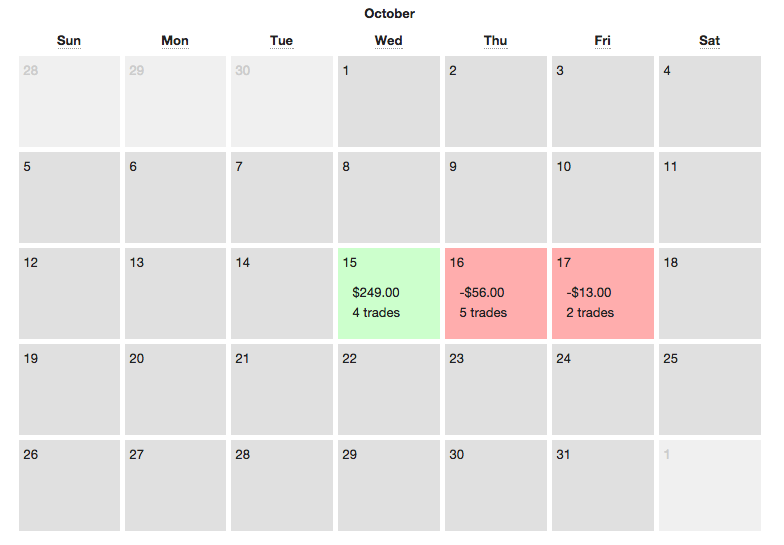 Also, Friday I was sick so I didn’t really trade except for the last hour. Looking forward to a full week of trading. It will be interesting to see whether we have a dead cat bounce before a real hard fall or if this is the journey back to new highs. I guess we will see! When we weren’t chopping today, I was ready to strike. I knew that with the blend of choppiness that I would need to keep my stop loss very tight. Not much else to report. I have a feeling market volatility will start to contract as we’ve had explosive days. I’m getting ready to transition off the sim account as well. Haven’t decided what day though… we will see if I completely change like Dr. Jekyll and Mr. Hyde. Hopefully not! So I thought I knew what it meant to climb out of a trading hole but today proved to be the real test. In a normal trading setup, I would have level 2 data up on all of my trading windows. This is especially true for options because I need to know the spread. Since I’m on this sim account, the data is delayed but the time and sales is up to date… that is what I have come to rely on. What I failed to account for today is with Google’s earnings coming up soon the spread will widen exponentially. I had an opening range breakout and as soon as I was in I knew something was wrong. Prints were very scarce and very far apart. I logged into my brokerage and looked at the level 1 data and saw it was a 50c spread… so what i essentially did was put myself at -500$ the minute I entered. I tried to limit out but that’s never an easy thing on the sim either. I’m not here to blame the simulator but I can tell you that things behave drastically different in real world application. Long story short, I took a bath and started the day -1300$. Previously, losing the first trade of the day set me up for disappointment since my confidence would be shattered that fast. Today was different. I went to the kitchen, grabbed some water and a coffee, and shook it off… determined to be on watch for any good trades. Funny thing is, I wasn’t on tilt like my first losing day where I kept forcing trades. I stayed level and guess what happened? I found good trades. I even found some great trades. I would have been on the path to my greatest day of gains to date had I not experienced that initial lost. After all was said and done with, I ended the day +83$. A trade like that I will never allow to happen again. It’s not very fun starting your day in the hole. Melatonin has been a real game changer for me. Sleeping through an entire night is something so foreign to me and this week was just great… but last night I had a few beers and I’m usually congested from those so I woke up 2 hours early and had trouble getting back to sleep. It’s fine, I had to take a nap today so I traded up until the last hour (which I guess some real selling happened). I had some nice opening range breakouts/breakdowns this morning so I locked in profits very quick. 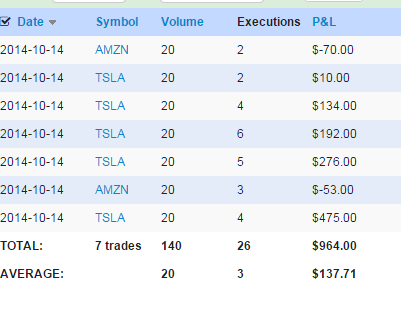 The Tesla trade was kind of botched but I blame Thinkorswim for that. It was profitable but I will be very happy when I can stop using their platform for execution. I haven’t found a graceful way to do it paper trading. I have no problem using it live but paper is just kind of wonky. Anyways, I hope you all have a great weekend! Here is a snapshot of my profit/loss so far. Keep in mind the one blank day I was -300$. Yes I traded yesterday, however, I closed my platform and couldn’t export the data from that session. It was a -$300 day but today I made up for it. We’re having some interesting times in the indices lately and I’m enjoying every moment of it I can… sort of. 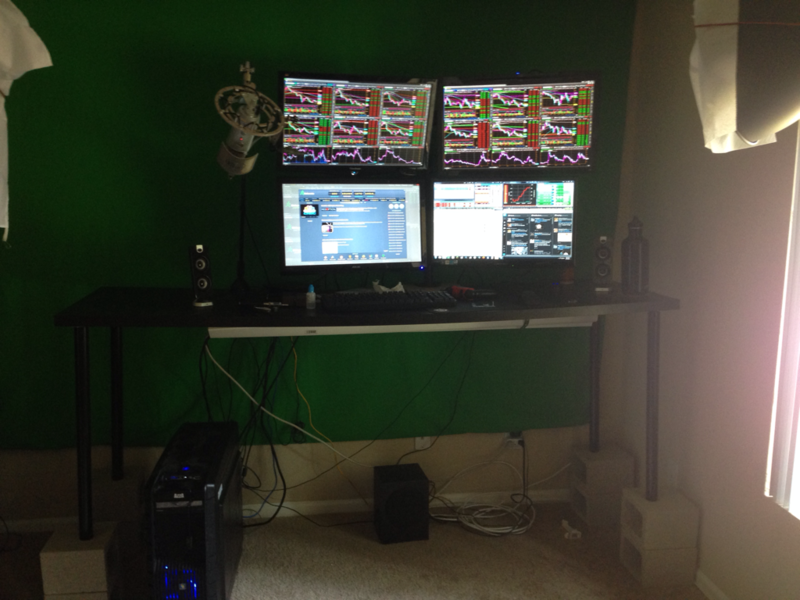 Today I had a nice set of trades going and decided that I was happy with my catch and wanted to take the plunge into rearranging my office/turning my desk into a standing desk. At 10AM I trooped off to Home Depot to get some cinder blocks. Ten dollars later, this is what I have. I’m excited to give it a real shot tomorrow and see how I feel. The reason why I wanted to try this was because with the new monitor array, I found myself slouching in my chair real bad. I know quite a few people who love their standing desks so this will be my 10$ trial. I have a few modifications to make regarding the height but you get the jist.